Projection radiography has long been used for pipe inspection and corrosion monitoring. The radiological wall thickness measurement of pipes and similar objects is based on the evaluation of shadow projections. In this traditional tangential wall thickness estimation the distance of border lines of the projected wall shadows of a pipe onto a radiographic image detector is a direct measure for the wall thickness.. This distance must be corrected by the magnification factor due to the central projection of the geometrical set-up. Visual evaluation uncertainties and the geometrical unsharpness of the edge projection can result in considerable measurement errors. Nowadays industrial radiographic film systems, imaging plates (also called CR - Computed Radiography) or flat panel detectors can be used as image detectors. The digital data acquisition (for film systems by a film digitization) enables additional possibilities for automated, computer based evaluation algorithms. Several algorithms have been developed and tested. 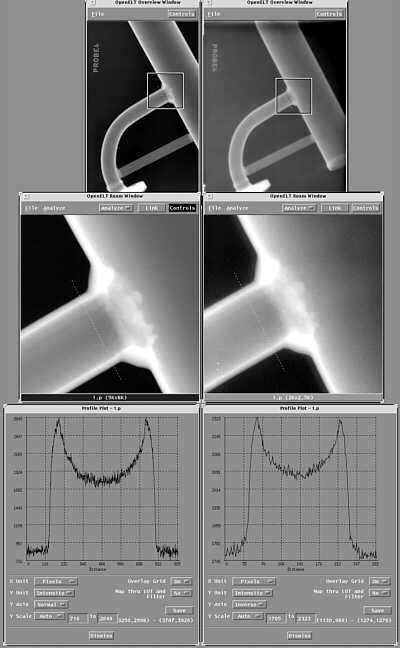 The tangential technique can be complemented by the possibility to measure corrosion defects elsewhere within the pipe. This eliminates the need to re-inspect pipe sections with other orientations of radiographic source and detector using the tangential technique. To access the defect depth in radiation direction the radiation dose proportional detector signal (film density or digital data value) at this point must be evaluated. This method as relative approach requires a special calibration step, because a relative intensity change of the radiation dose must be converted into an absolute wall thickness change. This is the basic disadvantage compared to the tangential projection technique, which gives directly an absolute estimation. Storage phosphor based luminescence imaging plates (IP) for computed radiography are a new medium for filmless radiography . This technology is based on the principle that phosphor can be developed in such a way that it will retain the latent image information until the moment it is stimulated by laser light. The light emission is proportional to the received radiation dose. A laser beam is scanned over the IP and the resulting fluorescent light is collected and amplified by a photo multiplier. The analogue signal is digitized and stored for computer access. The specific advantage of this technique is its higher sensitivity than classical film radiography and the potential for automated image processing due to the digital read-out of the IP's. Former investigations have shown  that the available IP's achieve the same contrast like NDT films with an IP type and scanner dependent unsharpness. Radiographic inspection is considered as a legal alternative for pressure testing of petrochemical installations. It has the major advantage that it does not require shutdown of the installation. Other NDT techniques such as ultra-sound or eddy-current may be used alternatively or complementary. As film we used AGFA Pb Vacupack D7 which was exposed using a portable Ir-192 source. The storage phosphor system was the DPS prototype developed by AGFA . It can handle IP formats up to 35x43 cm² in full daylight. The IP's were used in combination with appropriate Pb-filters (see ). For corrosion assessment we used IP prototypes (IPI) with an inherent unsharpness < 230 µm. 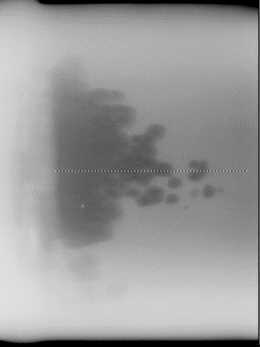 This should be compared with the inherent unsharpness of the film for an Ir-192 exposure which amounts 230 µm . In figure 1 a typical pipe section exposed in tangential projection technique is shown. The left column shows the D7 film digitized with a Laser scanner LS85 (Lumisys) with a pixel size of 50 µm and on the right hand side the IP scanned with 145 µm pixel size is shown. Note that the exposure time of the IP is only 25 % of the time for the radiographic film. In figure 1 the original data are shown as delivered from the scanners without any image processing. Only by contrast and brightness adjustment of the LUT's (Look Up Tables), which converts the 12 bit raw data to the 8 bit gray values for the display, the visual image representation of the digitized film and the IP on the monitor can be equalized. A typical set-up for the tangential projection technique is shown in fig. 4. The wall thickness estimation is based on the evaluation of profile plots along the pipe diameter as shown in fig.1 (lowest row). In fig. 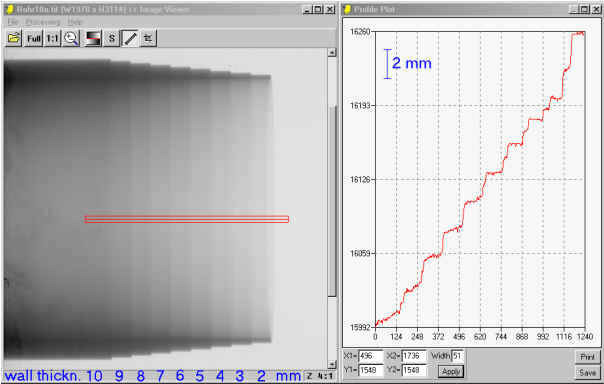 2 a measured profile (across the 8 mm step of the test pipe in fig. 8) is shown together with the fitted function of an ideal profile across this pipe. The background found by this simple fit corresponds well with results of Monte Carlo calculations about the scatter contribution at this geometrical set-up . The filter according equation (1) allows a practical application of a second derivative, because it has only the noise amplification like a first derivative. This is shown in fig. 3 on a experimental data set. The SNR of the true second derivative is too low for correct edge detection, whereas the CT filter gives reliable results. The idea to use adopted CT algorithms is developed further and discussed in detail in . The detection of the profile edges gives the projected wall thickness in pixels of the image data. The next step of data processing is the compensation of the magnification factor in the used tangential projection method. The error made by this simplification is shown in fig. 5. The values calculated with equation (3) are greater than the correct values according equation (2). This error is smaller than 1 % if the film focus distance is more than 6 times the diameter of the pipe. Fig 5: Systematic error of the simple formula (3) compared to the correct model according equation (2) depending on the ratio of film focus distance to pipe diameter. The wall thickness calculated according to (3) is greater then (2) by the given error. In fig.6 an example for the realized user interface is shown. The user draws the profile plot interactively with the mouse across the wall of the pipe. The computer returns the estimated wall thickness according equation (1) and (2) and draws the detected edge positions of the profile into the image (ticks perpendicular to the profile indication). Depending on the look up table used to display the image on the monitor the position of these ticks can be visually on "wrong" positions in the displayed image. That's why it is very important to detect the edges according to equation (2) on the original data set. The accuracy of the presented methods was verified using test pipes with various diameters and wall thickness of which the wall thickness was measured independently using a slide-rule. Both on film and on the monitor the wall thickness could be determined within an accuracy of about 0.2 mm. Projection radiography is widely used for pipe inspection and corrosion monitoring. DIR allows a direct access to the local radiation intensity variations by computer software. Following to a calibration step an interactive estimation of the local wall thickness change based on the obtained radiation intensity variation is possible. In practice this simple equation is complicated by the fact that µ depends on the radiation energy and beside the radiation absorption there is also scattered radiation generated by the penetrated object. Modern NDT film systems (with Pb screens) , IP systems and flat panel detectors are very linear X-ray detectors. Basically it is only possible to determine a wall thickness change in penetration direction from a density variation of a radiographic film. No absolute wall thickness values can be obtained in this way contrary to the tangential method. But there are many practical applications where no known wall thickness changes can be obtained from the radiographic film under consideration because at the exposure it was not known that such a feature is important for the evaluation. Our investigation shows that in this case µeff can be determined from a step wedge exposure with the same detector system, the same radiation energy, the same nominal wall thickness and geometrical set-up. apparent wall thickness changes by geometrical effects. The penetrated wall thickness is locally dependent in a central projection or can be influenced by the shape of the object (e.g. pipe). The second influence must be separated clearly from the first to achieve reliable results. This can be done in the most practical cases using symmetry axes of the object, where the geometrical influence is small compared to the real wall thickness change. 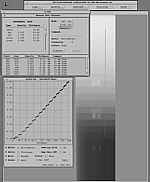 One implementation was integrated into the "NDT Scan Manager" system (DBA Systems Inc, Melbourne, FL, U.S.A). This SUN workstation based system allows film digitization, display, evaluation and archiving of images . A snapshot of the user interface for wall thickness evaluation is shown in fig. 7. "Measure Wall Thickness" This window is used for the dialog to calibrate the algorithm according formula (6) and for point wise measurements after calibration. The row "Ideal" indicates the nominal wall thickness used, "IQI" indicates the wall thickness values used for calibration and the detected optical density. "Local" can be used for noise reduction and compensation of geometric effects. "Profile Plot" This window display the data (gray values, optical densities or wall thickness changes in mm after calibration) along the line shown in the image window. After the calibration step an effective absorption coefficient according to equation (6) of µeff = 1.48 1/cm was determined (for X-rays at 160 kV). The profile plot in fig. 7 shows a highly linear relationship between the estimated wall thickness change (derived from the density variation of the digitized film) and the actual wall thickness (given by the step of the step wedge) over a wall thickness range of nearly 15 mm (at 160 kV). This wide wall thickness range is achieved by using film densities less then 0.5. In practice this is not usable caused by the low contrast sensitivity for corrosion detection in this region. Fig. 7 shows also the influence of the scattered radiation. This generates a slope of each step, which is increasing with increasing wall thickness. So the influence of the scattered radiation increases with increasing wall thickness. But the mean value of each step is still in accordance to Beer's absorption law, which gives the straight forward line of the total plot. The influence of the reduced contrast sensitivity at low optical densities can be seen on the noise level, which increases with the wall thickness. The same highly linear relationship as shown for X-ray penetration can be obtained for Ir192 or Co60 at higher wall thickness and with a lower contrast sensitivity . The same approach can be used for flat panel detectors or CR with IP's. Here the gray level in the image depend on the characteristics of the Analogue to Digital Converter (ADC) used in the IP reader. Typical characteristic transfer functions are linear, square root or logarithmic. The photo stimulated luminescence signal generated by the IP is proportional over several decades to the radiation dose exposed. By a 16 bit LUT the characteristics of the ADC can be corrected and a digital image generated, where the digital value is directly proportional to the penetrated wall thickness. This is shown in fig. 8 for a test pipe penetrated with Ir 192 and the AGFA DPS prototype CR system. A linear relationship of 20 mm is obtained. Practical applications of the presented algorithm have been done on corrosion monitoring in pipe systems of power plants. These examples were obtained from a reducing pipe fitting after an valve on a condensation trap. Corrosion damage was expected prior to the stop valve, but actual it was found after the valve in the reducing pipe fitting. In fig. 9 local corrosion by erosion is shown in a pipe with a bore of 100 mm behind a welding. In this case only the nominal wall thickness of the pipe is known (6.3 mm). To calibrate the obtained density changes into wall thickness changes a step wedge exposure with a nominal wall thickness of 13 mm (double wall penetration in the pipe exposure) and the same source / film system combination was used. From this a µeff = 1.30 1/cm can be expected which is used for the wall thickness estimation of the pipe image according to equation (7). The minimum wall thickness found with a manual ultrasonic wall thickness meter was 4.0 mm (»2.3 mm wall thickness loss). 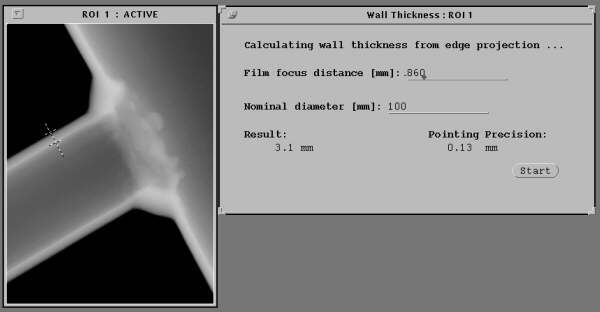 This is in good accordance to the estimated wall thickness loss by radiography, which shows for small spots even a higher loss up to 2.8 mm. The accuracy for these measurements is about 0.2 mm.